I did consider not posting this week, as I've been dilly-dallying, running here-there-everywhere and generally not really achieving much. Last week's update caused some differences in opinion over which blanket was better suited for my cousin's new baby. I must admit to carrying on with the pale green shell-stitch blanket, as I still feel that knowing the mother and it being her first baby, the plainer blanket would suit better. However, I will buy some more stylecraft and finish the other one too as I do love bright and colourful! I also showed you the start of a cat (please note I said cat, this may prove useful later) the pattern taken out of a book borrowed from the library. I mentioned last time how much I LOVE this yarn, it is Juniper from Sirdar (in mulberry) and it is divine! 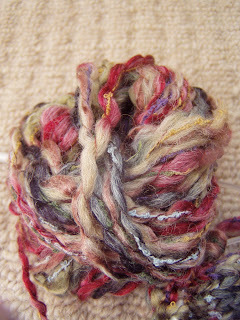 It is thick and thin and swirly and multicoloured....it is also in short supply....if only I had enough to make a garment out of it....... I have maybe 6 or so balls left but it doesn't seem to go far.....maybe when the weather gets cooler in the autumn I will make a cowl. I'm afraid it is not really as it should be....but hey-ho, it was fun to make and it is beautiful to look at! Our week of birthday celebrations for biggest boy culminated in a bowling party last night with a group of friends.....phew I'm relieved that is over! Today we've been enjoying the sun again....and it seemed we weren't the only ones. 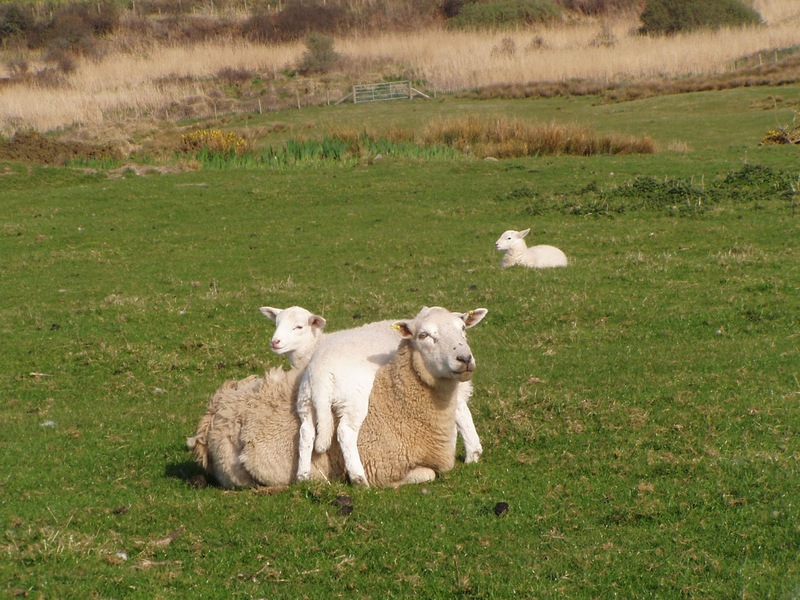 This young lamb was taking full advantage of the sunshine and a relaxed mummy......our lambing is just about over now and the weather has been very kind to us. Our normal season of lambing seems to throw everything at us, even a bit of snow a couple of years ago. 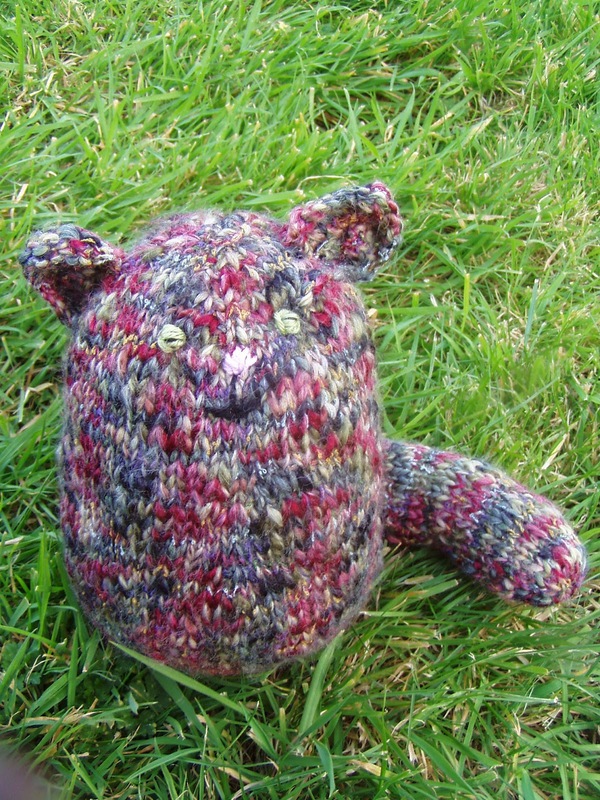 Anyway, to catch up with other year of project work, please check out the Ravelry page here. I think you know the mama best and your right to go with what you feel best for her, it happens that sometimes its not what we'd do personally but thats the fun, take my hubbys birthday pressie, not my normal thing to craft for him but something he'll enjoy. Would I be right in guessing its a cat lol. Well I can see its a cat and I think its fab looking, I love the yarn ! That yarn looks delicious! What fibre content is it Faith? Cute as a cat, but it'd be lovely as a cowl too! The little lamb sunbathing while draped across mom made me laugh out loud! Well of course it is a cat! And a very beautiful one at that. I haven't seen that yarn in real life but it looks very pretty and I'm sure it will make a beautiful cowl. That cat is very cute, I love him! That lamb is adorable. I like your cat, he looks very cute and cuddly. I love the photo of the lamb draped over hi Mum's back, great shot. The lamb picture makes me laugh. I'd like to be all stretched out laying in sun. lol. Glad you're going to finish you fun bright colored blanket, it was such an awesome start. That is a cute cat x and one chilled out lamb...love it! I love the cat!! and a cowl in that wool would be really lovely. The cat is really cute! I love the lamb photo at the end. :)I'm glad the chicken pox hasn't spoilt much! I adore your little cat!! The yarn really does look gorgeous... I've never used a yarn with that texture before, is it more difficult to knit with being thick AND thin?? I think a cowl is definitely the way to go with what you have left... all ready for next Autumn! I hope your biggest boy had a fab birthday... March is such a lovely month for a birthday! Thank you very much for my birthday wishes too by the way... and I am yet to be whizzing about on my bike as we still have to get the gears sorted. I too will most likely be a wobbly nightmare on it and the hubby will refuse to be seen cycling with me!...ha ha never mind! A gorgeous cat - it looks very snuggly and makes me want to squeeze it. That yarn would make a smashing cowl. Such a cute lamb photo!